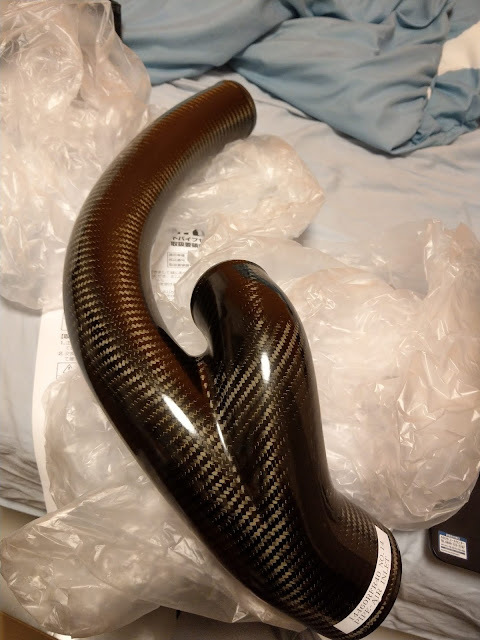 So my Christmas present to myself and my car, my naughty purchase at Nismo Festival. The Nismo carbon turbo inlet pipe (part number: 14460-RRR45). 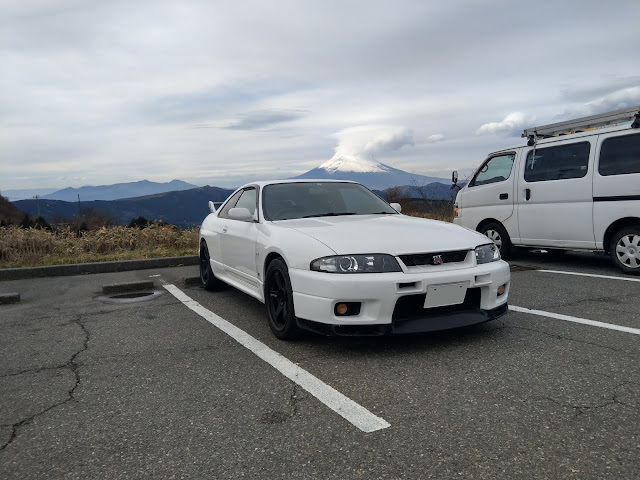 This was a part I was not intending on buying as it is a very pricy piece however the discount offered at Nismo Festival I could not pass on. 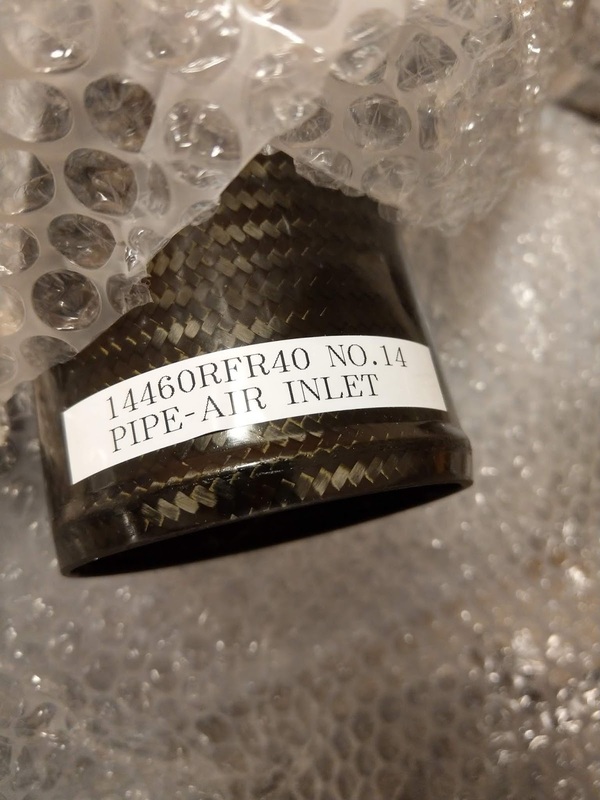 The shape and design is identical to the aluminim turbo inlet piping (Part number: 14460-RS597) only it's construction being of carbon fiber being the difference. There is the benefit of the thermal shielding characteristics of carbon fiber which in theory would shield the air inside the piping from the engine heat which sits right next to the piping and a slight saving in weight of carbon fiber over aluminium. 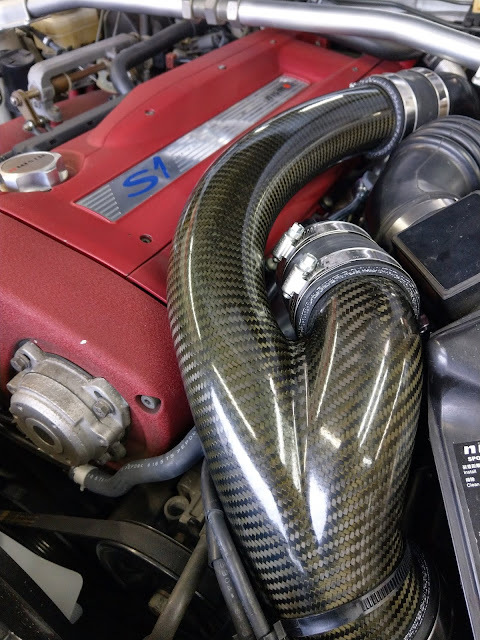 To introduce the Nismo inlet piping design itself carbon or aluminium it's design was based on the Group A BNR32 race car turbo inlet piping. 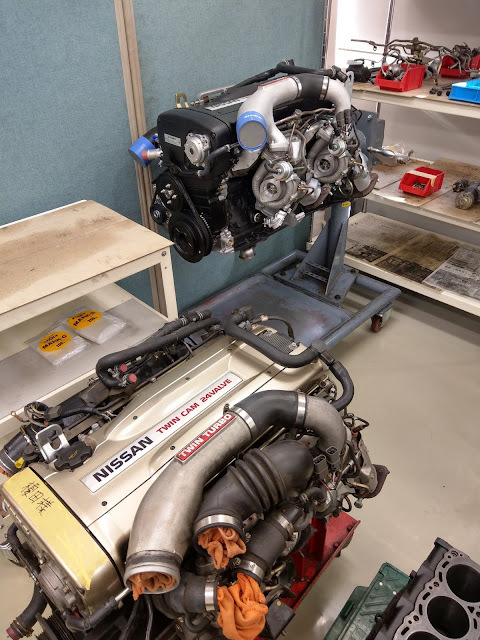 The issue Nismo found through their first race cars was that the merging of the air coming out of the front and rear turbos would not merge smoothly and cause unequal delivery between front and rear turbos ultimately affecting the response and linearity of the boost delivery. Think of it similar to the difference between an equal and unequal length exhaust front pipe. 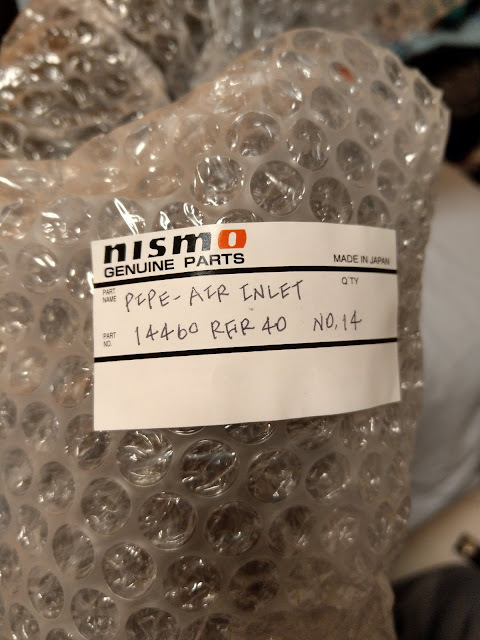 So the Nismo piping design is designed and tested to allow a more smoother merging of the air coming from both turbos with much reduced turbulence. 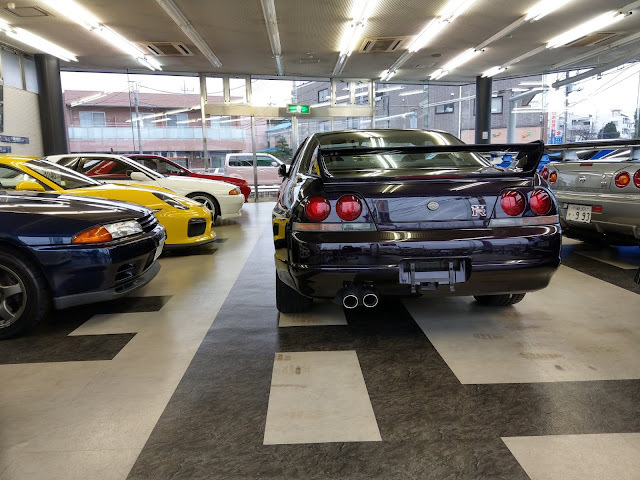 I went to Best R to get it fitted and waited while it was done in their showroom of exquisite cars. Yes that is a Cayman GT4 (left hand drive) in amongst the GTRs on sale. 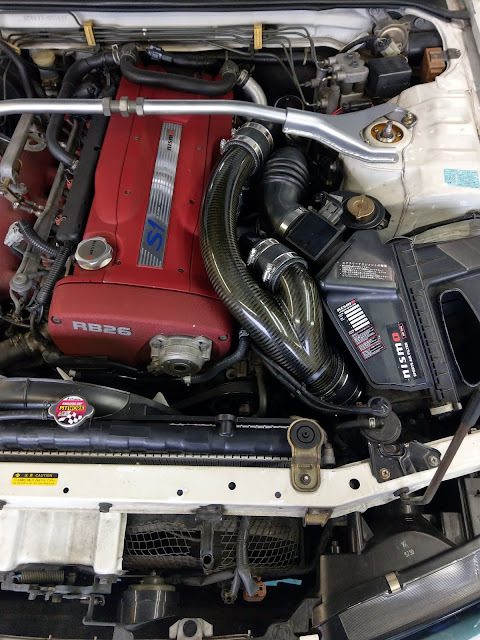 Here it is fitted while Konishi-san, Best R's resident mechanic was reshaping the airbox duct so that it would fit over the new piping. Up close it certainly looks the part and the fit and finish is what you would expect from an manufacturers motorsport division not the mention the piece of mind that it has been subject to the same tests as a regular Nissan component but just obviously to slightly higher standards as per a motorsport division. 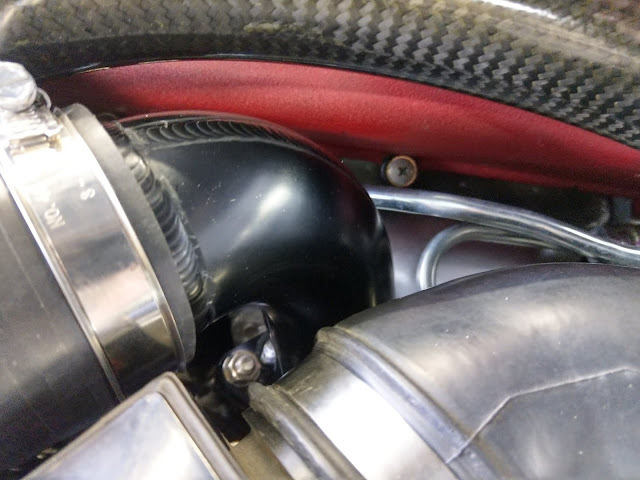 The attachments which fit onto the turbos themselves are aluminium as they are on the regular Nismo turbo inlet piping except painted in black to match the carbon main pipe. 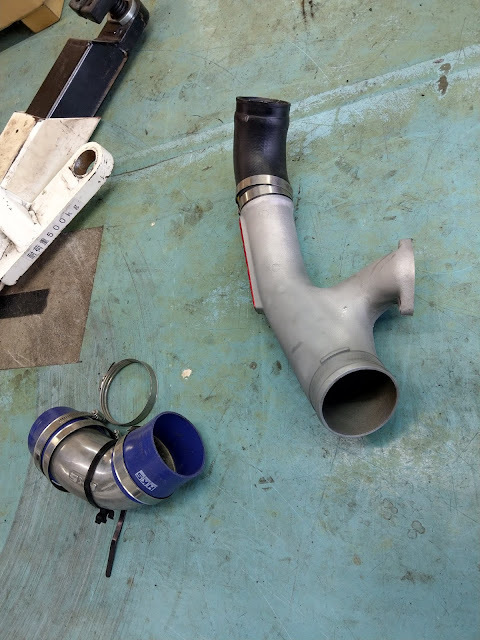 Here is the stock turbo piping. You can see how the merging of the air coming from the rear turbo would slam into the back of the air front the front turbo. 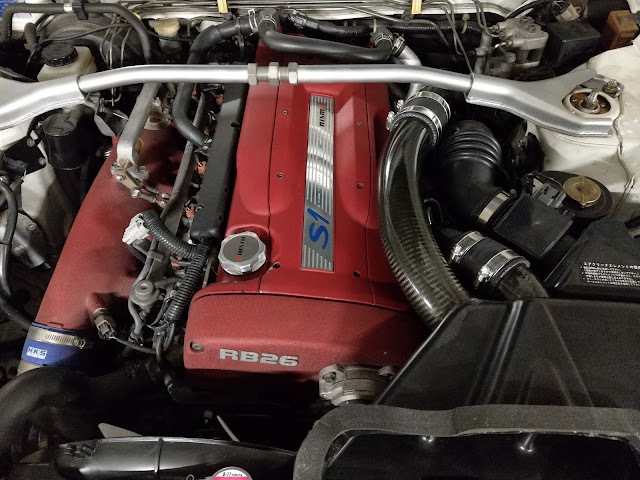 Oh and the aftermarket HKS aluminum piping which is a common mod for track rats to replace the OEM rubber tubing after the turbo inlet pipe to provide a stable charge and to avoid the deforming that can occur in the case of the rubber tubing. 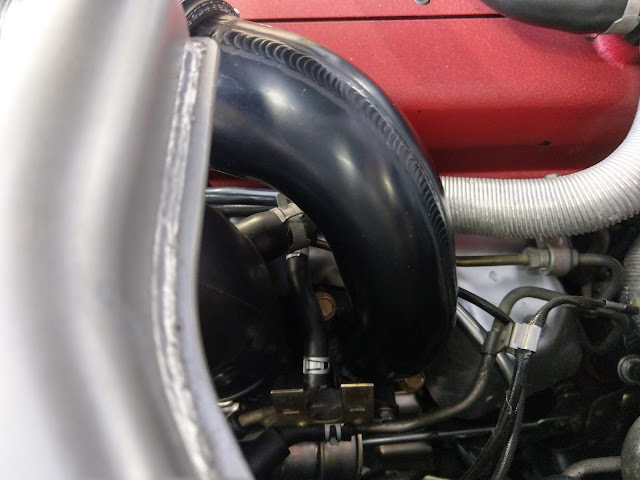 The airbox duct is quite a tight fit against the new inlet piping, which can be felt the resistance when closing the bonnet. It does leave me wanting the Nismo intake plenum to complete to intake side of the engine. Obviously there is no change in outright power as boost levels will stay constant with orifice controlled boost. However it is the delivery of the boost which saw a marked difference. 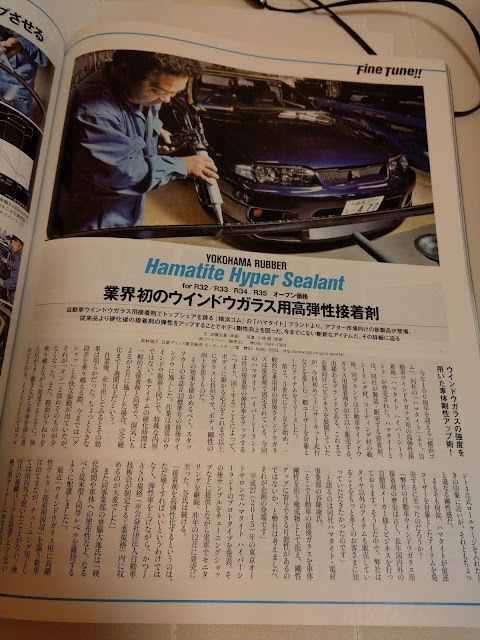 I took it for a quick squirt along the Wangan and Hakone. The boost used to come on at 3000 RPM but now starts at around 2500 RPM and mid-corner when previously there was alot of back and forwards shuffling between the front and rear turbos but now it is just solid stable boost with exponential delivery. 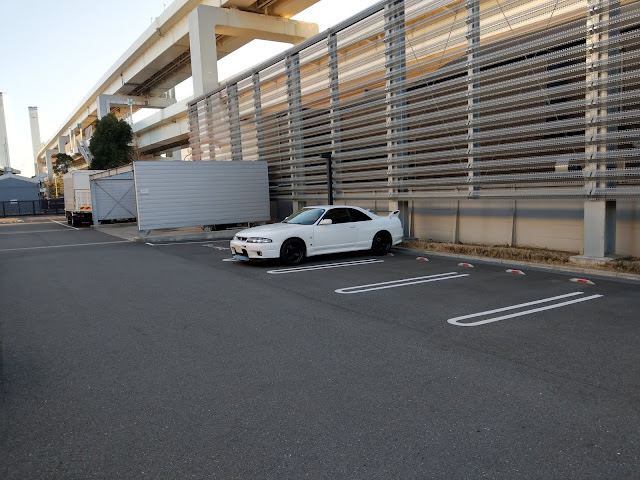 The result is I find myself having to hoof the throttle less due to more solid delivery of boost so across the rev range the boost has much more punch and linearity. Lastly there is a more variety in induction noise where I can hear the turbos spooling up as well. Quick squirt on Hakone this morning. 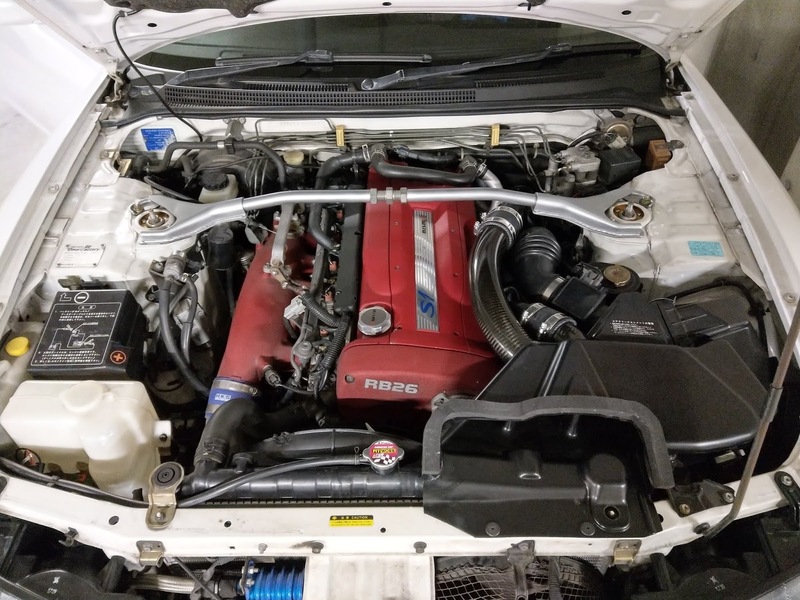 The car felt really punchy with the new inlet piping allowing me to drive more smoothly without having to hoof the engine as much. I will do a separate piece on Hakone as well coming soon. 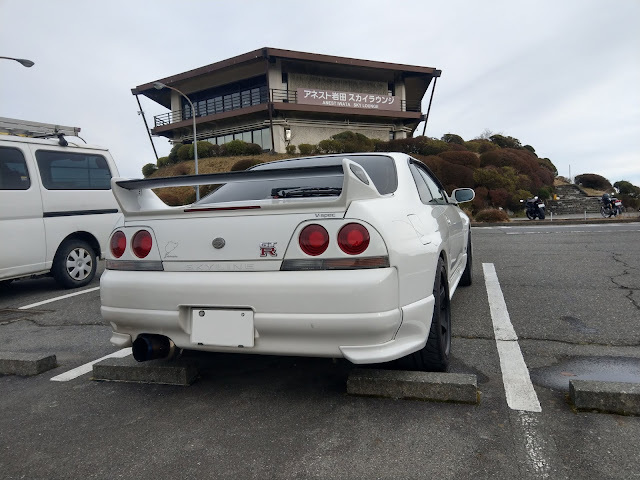 This'll be the last run at Hakone this winter as they have begun to salt the roads already. So just stick to less icey roads for the winter.